All transfers in Cairo, Luxor and Aswan (airport/hotel/cruise/hotel). Please note that this tour only departs on tuesdays only and can been done any time of the year. You meet our tour rep at Heathrow Airport and board onto your flight to Egypt. On arrival at Cairo International Airport, you will be assisted through the immigration and customs formalities. You are transferred by our deluxe coach to our 4* hotel in Cairo. Today you start early in the morning with a full day city tour of Cairo, visiting The Egyptian Museum, the Great Pyramids, Sphinx and Khan El Khalili Bazaars. 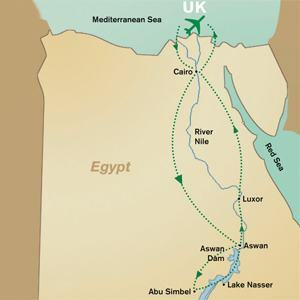 After all the visits, you will be transferred to the train station for an overnight sleeper train from Cairo to Aswan. (Train departs from Cairo at 20:30 and arrive Aswan at 08:50 the next day. Dinner and overnight on board the sleeper train. Early morning arrive the Aswan train station and head towards your hotel. (Check in time subject to availability). After lunch proceed to visit the famous sites of the High Dam, Unfinished Obelisque and the Philae Temple. Today you have an early morning check out and transfer to Abu Simbel by our deluxe coach. (Aswan/Abu Simbel 297 Km approx 03.00 hrs driving). On arrival at Abu Simbel you visit the Temples of Ramses II and Queen Nefertari. Later in the afternoon you return to Aswan to board our 5* Nile Cruise. Overnight in Cruise. In the morning, you visit the Valley of Kings, Queen Hatchepsut Temple, Colossi of Memnon. In the afternoon, you visit the Karnak and Luxor Temples, overnight in Luxor. (Tonight optional Karnak sound and light show. Today you check out of your Nile Cruise and the day to relax. In the evening transfer to Luxor train station for overnight train to Cairo. Early morning reach Cairo station. Depending on your departure flight you check into a Cairo hotel to freshen up, before giving you free time to relax and do last minute shopping. Later transferred to Cairo International Airport for return flight.